In English, we generally refer to someone as “he” or “she” based on what they look like. We have certain social and cultural codes that clue us in on whether someone identifies as male or female. But that line is becoming more blurred as women who identify as female adopt male clothing, men who identify as male adopt female clothing, and all the mixing-and-matching that occurs in between. For example, I dress in a mixture of male and female clothing but tend to favor male clothes because I find it more practical and more comfortable. But I identify as female in terms of gender, and as a demi- or Gray-A in terms of romance and sexuality. Would you be able to tell from my clothes that I want to be addressed as “she” or “Miss?” Maybe, but that isn’t certain. What if I actually identified as male and preferred to be called “him” or “Mister?” Again, there’s no way to know, and it’s a little rude and presumptuous to assign a gender without asking. But if acknowledging the gender spectrum is the norm in a society, a new method of addressing people respectfully without making presumptions about their gender identity would have to come about. In my own fantasy world of Marina where my novel Ravens and Roses is set, I noticed my own gender bias with pronouns and wanted to rectify it. Mariners don’t have a history of misogyny; it just never came up in their culture. Women are equal to men and that’s it. Homosexuality and bisexuality aren’t a big deal. Trans-folk can be changed to their preferred gender with magic once they turn 20, which in Marina is the legal age of adulthood. I don’t know how common it is and it isn’t central to the story, but the fact that it happens and isn’t a big deal is important to the linguistic framework of Marina. Because they don’t make the same presumptions about gender that we currently do, there has to be a neutral form of address that isn’t as clunky as using “they” and without making male or female the default when you don’t know. To that end, I decided to adopt the terms “se” and “ser” (pronounced “SAIR”) and make up a few other terms of address to fill the gap. 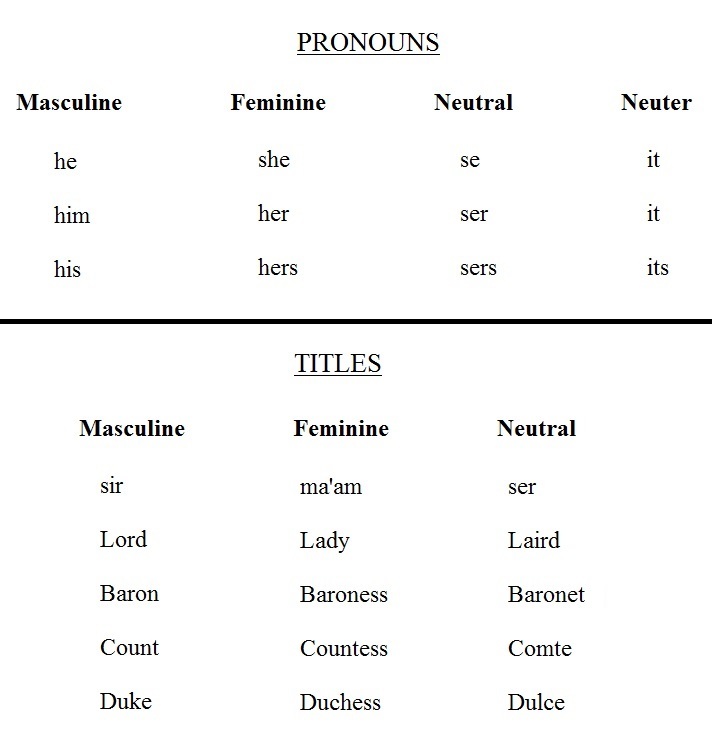 The chart for pronouns and terms of address can be found below. For the sake of simplicity, I did not include the ubiquitous plural form “they/them/theirs,” so the Mariners have four gender pronouns: Masculine, Feminine, Neutral, and Neuter. Neutral is the most respectful and is used when addressing someone for the first time, or when their gender identity is unknown. With nobility it’s a little easier to address them because when they reach adulthood, they register their title as Lord, Lady, or Laird and so on. When they are introduced at events, their title lets people know what gender pronoun to use. Neuter is used for inanimate objects, and therefore has no title. It’s not perfect, and probably won’t come up much in Ravens and Roses itself, but I wanted to at least be aware of it and try to combat gender assumptions where I could. Maybe this chart or idea will help other writers where gender or sexuality play a larger role in their story. You can check out the Nonbinary Wikia and their list of pronouns for more ideas you can adopt in your speculative fiction. What stories have you read where the issue of gender neutral pronouns was addressed, or at least mentioned? Please share in the comments below! This deficiency in language is something that’s bothered me in everyday life, but I’ve never thought of addressing it through fiction. That prospect is exciting because sometimes – rarely, but sometimes – a fictional word or idea can be so useful that it’s adopted by the real world! P.S. – It’s admirable that you’ve not only overcome a semi-homophobic upbringing, but are now a bit of a champion of nontraditional identities! Thank you so much for reading and commenting, Shelverman! Fantasy and science fiction are, I think, in a unique position to extrapolate from what we have into what “could be.” They’ve been used as social commentary, inspiration, and wonder before, and new times call for new areas of exploration. Fiction in all its forms is integral to our growth and development and I think it’s great to push the boundaries and take a look at those “what ifs” beyond the horizon. Why limit ourselves to what is “real” or “normal” in stories populated with spaceships, elves, aliens, and dragons? I really like the ze pronoun that has been popping up. I’m with Shelverman; the acceptance of gender-neutral pronouns is something that fiction could hasten.